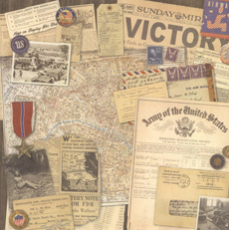 This following Military Scrapbook Kits from K&Company were purchased as a kit and contains 6 12 x 12 Printed Papers, Grand Adhesions Stickers, Clearly Yours Stickers and flat stickers. 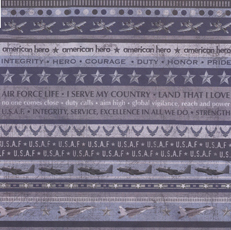 These kits of Military Scrapbook Supplies by K&Company are available for the Air Force, Army, Navy and Marines. With the exception of the Title Page, the background papers are all the same, as are the Clearly Yours Stickers and the flat stickers. The Grand Adhesions stickers for each branch of the service are distinctly different. The samples of the stickers are further down. 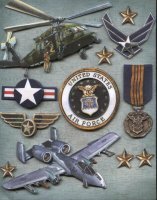 If you are planning an entire themed book of your Air Force hero, this is a great page to start off with. 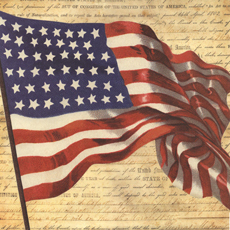 Use this as the background for your title page, especially if you have that formal photo that is often taken with our flag in the background. Put on some lettering or journaling in Blue with your service members name and maybe other items like rank and dates of service. Very simple, but it introduces who the book is about. 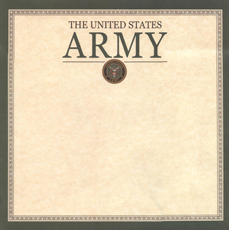 If you have purchased one of the K&Company Albums shown on our Military Scrapbooking page then you may already have this title page. If you do, you can always use it elsewhere in the album, possibly for that last single page. 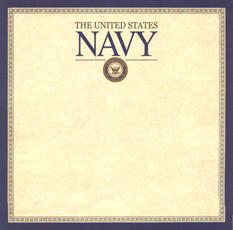 For each of the branches of service, the Military Scrapbook Supplies kits each contain the same five sheets below, and of each kit package contains four page ideas for you to start your layouts with. The package reverse will also show you samples of the all the papers in the kit along with the embellishments. 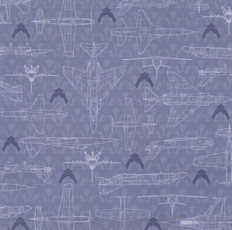 This vintage piece of background paper will go very nicely with a vintage photo or two. 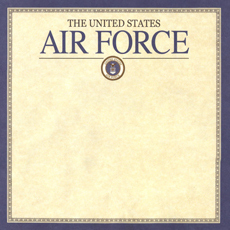 It is not specifically related to the Air Force, but you can always place photos over the icons that are not appropriate for the photos or branch of the service you are scrapping. A nice idea for the opposing page would be to use a tan colored solid background paper with some of the stickers and embellishments from the kit. These are the Flat Stickers & Clearly Yours Stickers, the same in each K&Company Military Scrapbook kit and they are a beautiful match for all the papers in the kit. So much so that I think you could mix each paper in the kit with a solid color background paper to match for each 2 page layout and use these stickers on the non-kit page to tie into these wonderful printed backgrounds. A good way to stretch your special papers embellishments. 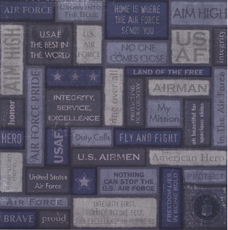 These 3-dimensional stickers will fit beautifully on your Air Force Scrapbook Layouts. 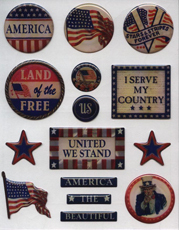 These 3-dimensional stickers will fit beautifully on your Army Scrapbook Layouts. 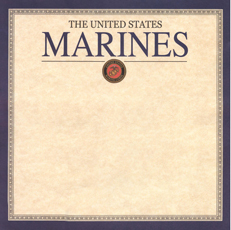 These 3-dimensional stickers will fit beautifully on your Marines Scrapbook Layouts. 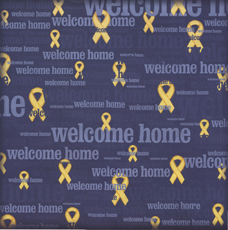 These 3-dimensional stickers will fit beautifully on your Navy Scrapbook Layouts. And of course, you just can't think of any Military Scrapbooking with out a Dog Tag or two. 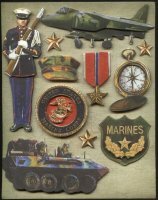 Isn't that the ultimate of Military Scrapbook Supplies? I recently purchased some Dog Tags from a provider where I was able to pick the wording, the type of metal, the type and color of chains, and even had a choice of colored silencers. The web site provides a view of the completed tags and is really easy to navigate. 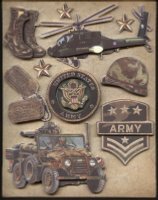 You can get you Dog Tags with the rubber covers for the edges and I use those in different colors to ID my Military Scrapbook Albums with the name of the Family Member on the Dog Tag hanging on the back spine. Delivery from these folks is was also very fast. 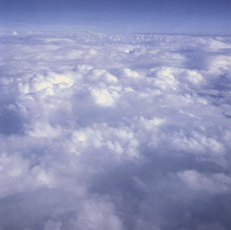 I think you will like them. 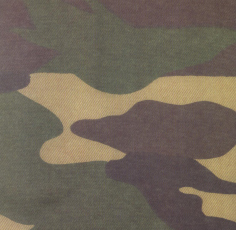 To add to your stash of Military Scrapbook Supplies, check out 1001 Free Fonts.com to see some of the Military Fonts available to finish off the journaling for your layouts. 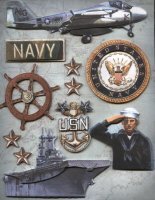 Another supplier of Military Scrapbook Supplies is Creative Imaginations and their Signature Collections kits. 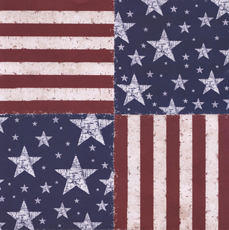 Below are the items in their U. S. Air Force Scrapbook Kit. The back of this kit package contains photos of each of the papers, and all the embellishments, along with 2 page ideas using the kit contents. There are a total of 6 12x12 pages, 1 12x12 card stock page of 45 adhesive backed stickers, and one sheet of 17 epoxy stickers. 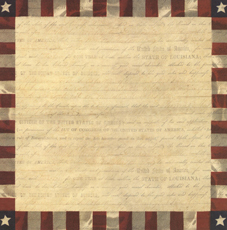 This interesting paper of phrases and images can be used as is as a background sheet or can be cut into strips like paper ribbons along the design sections and used as embellishments along with these kit papers or with coordinating papers from your scrapbook "stash". 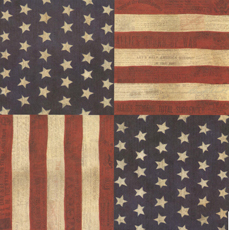 This flag paper is similar in design to the one above from K&Company in layout, but the colors are a little brighter and it looks a little more antiqued or rustic. There are 45 adhesive backed card stock stickers on this 12 x 12 sheet. 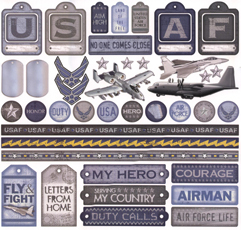 Plenty of stickers to use on these layouts and many more layouts about your Air Force service member. Add in the Epoxy stickers below and your stash of coordinating scrapbook papers and you could really get an entire themed album of as many as 20 layouts with the embellishments in this one kit.